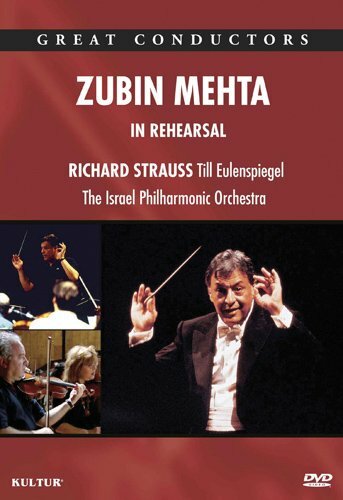 On July 18, 1996, the Israel Philharmonic Orchestra, conducted by its Music Director Maestro Zubin Mehta, gave it's first-ever performance of Richard Strauss's tone poem Till Eulenspiegels lustige Streiche Op. 28. As one of the world's foremost interpreters of the great symphonic literature, excelling in the Romantic works of Bruckner, Mahler and Richard Strauss in particular, Mehta has conducted this enormously popular masterpiece on countless occasions, but it was the first time ever that he had rehearsed it from scratch. New York, NY (April 27, 2011) � Kultur is proud to announce the release of another entertaining and informative program in The Great Conductors Series; Zubin Mehta In Rehearsal on DVD available May 31, 2011, for a suggested retail price of $19.99. At a press conference given to launch the series, he expressed great excitement at having the cameras present while he was working on Till Eulenspiegel with his own orchestra, welcoming the unique opportunity and challenge this presented.